What’s your opinion about Easter? Are you one of those who believe its time to eat more chocolate eggs? Or you’re one of those who don’t believe in Easter celebration because there’s no date in scripture for its celebration? If you’re a Christian what does Easter mean to you? As a Christian, Easter means the death and resurrection of our Lord Jesus Christ. I can boldly say that Jesus Christ died and on the third day, He woke up again and He is sitting at the right hand of our father God Almighty. Let’s share something in the Bible in John 19:30; 20:11-18, Matthew 27:50; 28:5-6, Mark 15:37; 16:6, Luke 23:46, 24:5-7. All these gospel writers testified the crucifixion and resurrection of our Lord Jesus Christ and because of this that we are saved today. Beloved I believe our Lord Jesus Christ suffered under Pontius Pilate; was crucified, dead and buried; He descended into Hell; The third day He rose again from the dead; He ascended into heaven; And sits on the right hand of God the Father Almighty; From thence He shall come to judge the living and the dead. If Christ has not been raised, our preaching is useless and so is our faith. And if Christ has not been raised, our faith is futile; we are still in our sins. Christ’s resurrection is the central teaching of Christianity. According to Paul in 1 Corinthians 15, if he wasn’t resurrected, then Christianity is a complete shame; all who believe in Christ for salvation are still in their sins and to be pitied if Christ was not raised. For those of us who are believers, the resurrection is extremely important. If Christ was not raised, we have no hope. Paul confirmed that, “Christ has indeed been raised from the dead, the first fruits of those who have fallen asleep” (1 Cor. 15:20) and concludes that: “Death has been swallowed up in victory, O death, where is your victory? O death, where is your sting?” (1 Cor. 15:54-55). The resurrection of Christ is the ultimate reassurance to all believers that death has finally been defeated. We will all be resurrected, just as Christ. Once you understand that Easter is a celebration of the defeat of death, we will finally understand why we celebrate this holy day. Easter is also reflecting about ourselves i.e. committed sins, attitudes, characters, behaviour, depiction of our human signboard etc and asks for forgiveness where we fall short. It is also a time to bury all our sins and differences with Christ Jesus and rise up as a new leaf. Christ Jesus forgave the sins of the soldier who nailed him to death and even the other thief as well and so we need to forgive ourselves. Forgiveness is one key thing in Easter and as Christians, we need let this be part of us. Beloved if we can forgive ourselves and let bygones be bygones, then we need Christ Jesus in our hearts in other to do this. Jesus Christ died because of you and me. The Bible says in Hebrews 3:7 and 15 that if we hear the voice of the Holy Spirit today, we should not harden our hearts. Beloved lets open our hearts to welcome our Lord Jesus Christ and allow Him to live in our heart this Easter and renew our relationship with Christ. Happy Easter and remember God loves you. John Wesley was credited the founder. Now you know which church I am talking about. It was established in the 18th century after it branched out from another establishment. Common “product” in all our “stores” is music in the form of hymns. The founder and his younger brother, Charles contributed a lot to this “product” and would wish we keep that tradition. Most of our “stores” are open for business for a maximum of two hours on a typical shopping day. Actual “sales” last for about an hour. It is encouraging to note that most of our “stores” in other countries are doing very well. Any ideas how we can improve the image of our “store”? Where are you seeking wisdom? When the queen of Sheba, also referred to as the queen of the South (Matthew 12: 42) a woman of great wealth, beauty, and power, heard about king Solomon’s reputation, greatness and wisdom which had brought honour to the name of the Lord, she travelled twelve hundred miles with her entourage, from her home in southern Arabia to Israel to see for herself, “the fame of Solomon concerning the name of the LORD, and to test Solomon with hard questions” (1 Kings 10:1). On camel’s back, the Queen of the Shebeans travelled with her entourage; she carried with her, gifts of gold and spices and precious jewels. She made this long and difficult journey all because she was more interested in the divine wisdom which only comes from the Lord and not human. The Queen was rich and powerful in her own right, with countless advisers, counsellors, kingmakers at her disposal, yet she was wise and humble enough to seek additional wisdom from the wisest man of her day. A search which brought the Queen to confess and recognize not only Solomon’s divine wisdom and wealth, but also the LORD God who is the source and giver of wisdom and truth. Why was she seeking divine wisdom – Divine wisdom enables us to be tolerant, accommodating, humble, caring, loving, and above all going the extra mile for the sake of others. Queen Sheba was impressed by both Solomon’s words of wisdom and hospitality (1 Kings 10:4ff). Are you seeking divine wisdom? And where are you seeking it? Do you see the need to make a ‘long journey’ as the Queen of Sheba did to obtain wisdom? What personal price would you pay in order to obtain wisdom? Scripture exhorts us to get wisdom and understanding, virtues needed in this present life for peaceful co-existence. Getting wisdom is the most important thing you can do! And whatever else you do, get good judgment. “If you prize wisdom, she will exalt you. Embrace her and she will honour you. She will place lovely wreath on your head; she will present you with a beautiful crown” Prov. 4:7–9. Having arrived in Jerusalem, and seeing the magnificent splendour of Solomon’s house, the entry way to the temple, the extent of his riches and wisdom, she was overwhelmed and so was compelled to praise Solomon’s God and shower Solomon with extravert gifts of gold, spices, stones. Every woman who seeks wisdom from above is a woman of grace and beauty. Many will rise up and call her a woman of worth and Proverb 31:28 tells us that her children stand and bless her. Her husband praises her ‘There are many virtuous and capable women in the world, but you surpass them all’. How and where are you seeking divine truth and wisdom? When the Ghanaian Methodist Fellowship (GMF-UK Chaplaincy), launched its welfare scheme in 2009, many are those who thought it would be a fiasco just as the previous attempts. Three years down the line and the scheme is going stronger with many beneficiaries giving good testimonies about the scheme. The welfare scheme currently has 160 members, and has helped members in celebrating birthdays, Christening, those in ill health, bereavement and relocation. The welfare scheme which was launched in January 2009 is being managed by 8 member committee known as the social responsibility and welfare committee. 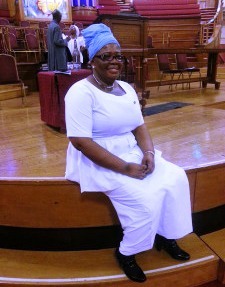 The committee’s chairperson sis Grace Vera Mawu. The GMF Publicity Committee had an interview with the chairperson to find out how the scheme is doing. What prompted the GMF leadership to launch a welfare scheme? Answer: The GMF is a fellowship not a church, which fellowships once or twice a month. For that matter it did not have the strength of supporting members financially. In order not to burden the fellowship financially as regards bereavements, marriages, christening, sickness or ill health, the leadership of the fellowship decided to set the welfare scheme to allow members of the fellowship to make contributions which can be pooled together. Such contributions will enable the fellowship have extra income aside the offertory which can be used to support members in their time of joy such as marriage or christening, or in their time of sorrow such as bereavement or ill health. What are the criteria for joining the GMF welfare scheme? Answer: The welfare scheme is an all inclusive scheme. It is opened to every member of the fellowship who wishes to join. By this I mean there are no barriers to any fellowship member joining. I must however stress that, because it is a voluntary and not compulsory scheme, only registered members who have paid their membership dues up to date enjoy the full benefit of the scheme. Apart from financial assistance, what other benefits do members of the scheme get? Answer: The welfare scheme was set up to see to welfare of the fellowship members as a whole. Financial benefit is just an aspect of the welfare scheme. The welfare sees to the well-being of every member of the fellowship. Members receive pastoral care, house visits, etc. Members are given specially designed GMF birthday cards during their birthdays at service in Central Hall, as well as subsidised summer outings. What are the challenges of implementing such a scheme? Answer: Considering the history behind the setting up of the scheme, the challenges are enormous. From whipping members interest in the scheme so as to subscribe to it, to getting members to make their monthly financial commitments. Nonetheless, the leadership of the fellowship led by the Rev Davis are very much poised to implement this welfare scheme come what may, because of the several benefits this scheme has brought since its inception. In your opinion, what could the scheme achieve that hasn’t happened yet? Answer: Although membership to the scheme is not compulsory, my wish is to see a 100% subscription to the scheme. It might seem a very ambitious wish but if we continue to drum in the benefits that the scheme brings, we might be able to achieve this wish. Apart from membership fees are the other source of funds to the welfare account? How are monies from the welfare scheme kept and accounted for? Answer: The welfare scheme has its own accounts and the chaplaincy treasurer has an oversight responsibility over. The welfare committee has its own treasurer who prepares quarterly reports of monies collected by members of the welfare committee to the chaplaincy treasurer to make sure there is reconciliation in monies collected and banked. Are the members of the scheme of any particular demographics example, gender, class and age? Answer: Not at all, we have members of all gender, age, class, etc. Any member at all in the fellowship can join the scheme. What is important however is that all members must be able to make their monthly contribution towards the running of the scheme. You are having a symposium on April 26. What are you hoping to achieve from such event? Answer: We expect that members will attend and put forward suggestions that will help better improve the scheme and probably get more people from the forum who are not yet members picking up membership forms to join the scheme. 10. What would you say to the GMF members who are currently not members of the welfare scheme? Answer: The scheme is there to support all members, those already subscribed to it can attest to the great and positive contributions that the scheme is making in their lives and that of their family. We will entreat those who are not yet members of the scheme to pick up forms and become members. We are aware that some members have fears of this scheme being like the previous but we want to assure everybody that every necessary step has been taken to ensure this scheme is a success.